I picked up this beautiful item at Romsey on Sunday and was amazed when the seller had told me not one person had looked at it. It is a 4 piece bamboo and cane bottom 3 with a greenheart top.All the pieces fit perfectly inside each other, as with all good poles but like a lot of quality tackle it is unmarked. It is 36" long and 11' 9" when erected. These items are quite rare and a quick troll over the internet solves nothing. Has any TFF member seen one like this before as a maker and possible date would complete what is a quite superb item of vintage tackle. I have discovered that these sticks were not for poachers at all but for illicit angling on a Sunday. Any activity apart from church was frowned upon in the 19th century on a Sunday hence the "Sabbath Stick". A poachers stick of the same format would probably not have had the same quality. Last edited by Fredline on Mon Oct 09, 2017 9:17 pm, edited 2 times in total. Re: Cane Walking Stick / Poachers Roach Pole. Help! No Gentleman should be without one !!! I'm very envious, Sir. Well found. What a lovely find, I had a look on Google and all I could come up with is that they are called system canes, some canes had guns incorporated into them. Google.. fishing rod system cane. "Poles Apart" by Michael Nadell would help. Lovely object Charles Farlow had walking stick rods in his 1846 catalogue as I'm sure did many others. Probably the fishing equivalent of the golfers Sunday stick,anything to have a sneaky bit of participation of your pastime. Well done John a cracking find! I did see you walk past with it on Sunday, but I thought it was a "Sowerbutts" walking stick! I am totally jealous what a find absolutely beautiful . It could be Sowerbutts because J H Sowerbutts was mainly a stick maker with only about 25% of his work was actual fishing rods . Is there any markings at all . Blimey! I was there and didn't see it. Great buy. 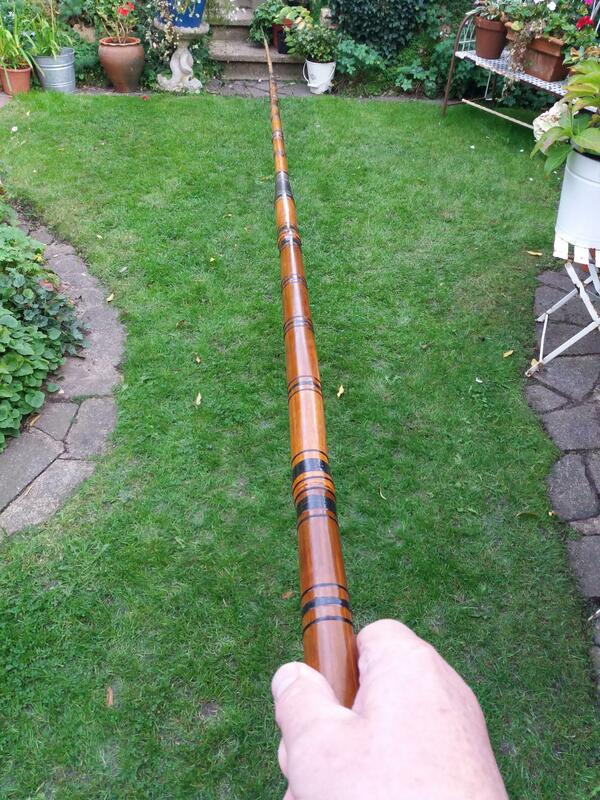 I have just added another picture of the walking stick fully assembled.